Crashed in rough terrain due to unknown circumstances. 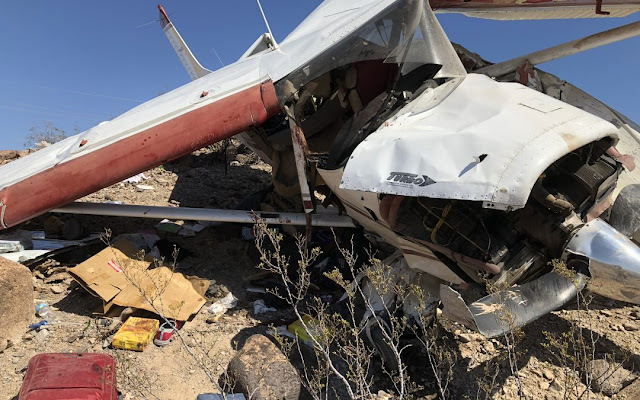 BULLHEAD CITY — The Bullhead City Police Department has identified the two victims of Saturday afternoon’s crash of a Cessna A185F Skywagon as William and Vicki Zurcher, a married couple from Washington. The Zurchers were in stable condition at Sunrise Hospital on Sunday, police said. William Zurcher, 78, the pilot, was flown to Sunrise from Western Arizona Regional Center, where he had been taken by ambulance from the scene of the crash. He suffered a head injury. Vicki Zurcher, 67, was airlifted to Sunrise directly from the accident site after being freed from the plane’s wreckage. She was the passenger and told first responders that she was suffering chest pains. 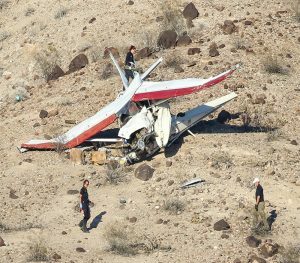 Their Cessna A185F Skywagon crashed Saturday at around 1 p.m. near the Laughlin-Bullhead International Airport from which they had departed. Police said that the couple was on their way to Phoenix when the crash occurred. The crash site is about three-quarters of a mile from Bullhead Parkway between Laughlin Ranch Boulevard and Silver Creek Road. 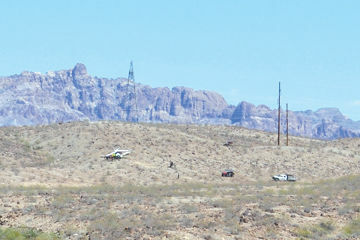 Personnel with the Bullhead City Fire Department needed a way to reach the couple quickly because the aircraft came down in rough desert terrain. The department’s road brush unit and specialized utility task vehicle, which is equipped to transport a patient from a remote location, allowed for that, said Battalion Chief Joshua Livermore. “Fire crews used hydraulic cutting tools to remove the passenger from the wreckage,” Livermore said. Seven BCFD units and 13 employees responded to the location. A retired fire captain also helped with the rescue effort after seeing the incident from the road. The person’s specialized vehicle was used to guide BCPD personnel to the crash site. The Federal Aviation Administration described the location as being about 1-1/2 miles southeast of the airport. Police also reported Sunday that the National Transportation Safety Board is taking over the investigation. BULLHEAD CITY — Two people injured in a plane crash Saturday afternoon near Silver Creek Road are recuperating at a Las Vegas hospital. The occupants of the plane have been identified as William Zurcher, 78, and his wife, Vicki, 67, of Washington. Bullhead City Police spokeswoman Emily Fromelt said Sunday that William Zurcher was later airlifted from Western Arizona Regional Medical Center to Sunrise Hospital for further treatment. Vicki Zurcher had been airlifted from the plane crash scene to Sunrise Hospital after being extricated by fire personnel following the crash. The Zurcher’s plane crashed about 1.5 miles southeast of the Laughlin/Bullhead International Airport shortly after take off. They were reportedly en route to Phoenix, said Fromelt. The cause of the crash will be investigated by the National Transportation Safety Board.